Having just emptied enough sand to build a toddler a prize worthy sandcastle from my ears and left plenty for said toddlers older sibling to do the same strewn through my house I had a thought when I was in the shower about the 3 day camp I have just completed with a whole bunch of InnerFight clients, 4 preparing for the infamous Marathon Des Sables and another 4 for a new 250km footrace through Sri Lanka with Ultra X. This weekends camp was the 3rd in a series of camps to prepare people for these multistage races which if you have followed some of my stuff for a while you will know are a big part of my life and if not have a read here to get an idea of what we are talking about. As these races are normally around 250km run across some of the worlds most brutal landscapes on back to back days it is important that over a period of time we get people doing back to back days, building the run volume and working on their adaptation to being able to get up day after day for “life” during these races. However, as the title confirms this is not about the running. The running is to a large extent a matter of procedure. Having done multiple ultra marathons myself and developing an ever growing stable of ultra runners at InnerFight Endurance I am more confident than ever in our ability to take a non or novice runner to an ultra marathon and beyond. The running is the “easy” bit. On Tuesday evening on the InnerFight Endurance Ultra Runners WhatsApp group someone posted the weather forecast for the weekend. Rain and storms! My immediate thoughts? “Perfect”. 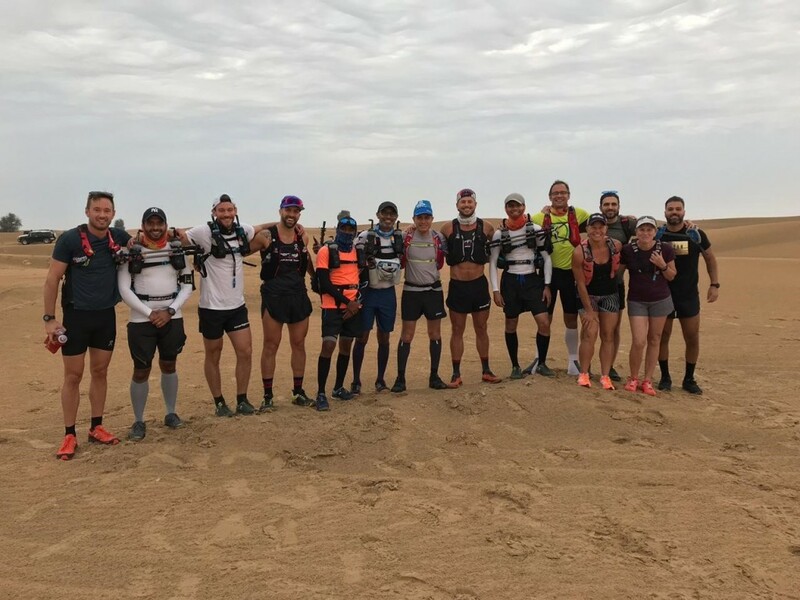 You have heard it many times “you cannot control the weather but you can control how you react to it.” I was clearly excited as we had 30km to do on Thursday afternoon, 50km Friday and 25km Saturday through and around the Al Qudra desert. The thought of adverse weather brought the biggest smile to my face. Of course given the choice I would rather not have sand in my mouth and eyeballs to mention a few of the more desirable locations, but my goal for this weekend was simple. To get over 10 people through “ultra camp 3” and have damn good fun doing it, the forecast was only going to make this better. 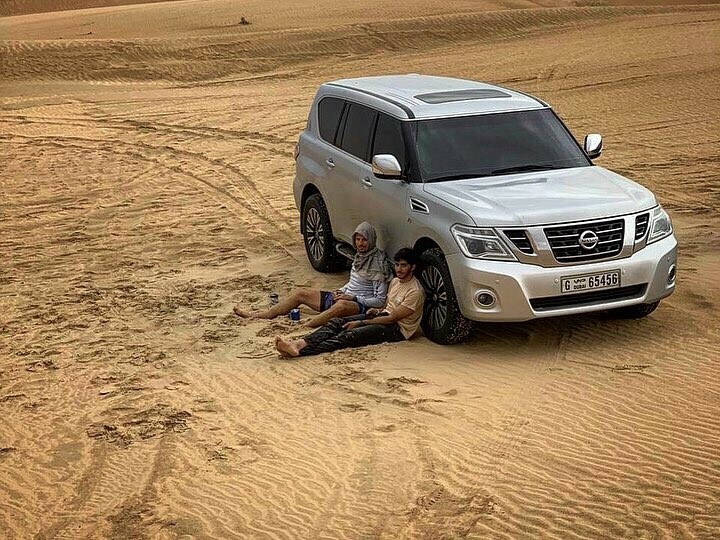 As soon as you step out of your car in the desert with the wind, sand is everywhere both inside and outside of your car. And so at 3:29 as we started our 30km afternoon run and the journey began. As this was the final week of heavy training volume, the guys were coming into today with 20km already in the legs from Wednesdays run, never the less excited for the weekend. Day 1 is always nice and straight forward as you are fresh, have slept well the night before, smell nice and so overall you feel pretty good. That of course changes after a night under the stars on the sand and Thursday night served us up a treat. Incredible lightening shows at 3:30am followed by an insane downpour and of course topped off with high winds. And before you ask, yes under the stars, no tents allowed because that’s similar (or harder) than the races so it must be trained. Sand blowing into your face when you are sleeping is unique but then rain on top takes it up a few gears. 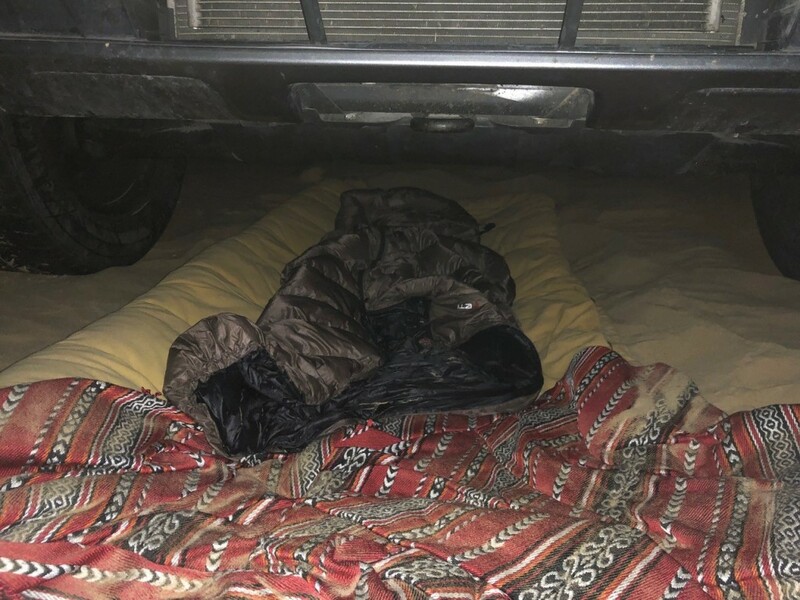 My party trick for a few years in these conditions is to sleep under my car using it as a shelter, so far 100% success rate. Fridays plan was to give these guys a new experience, one that I knew they were physically able to handle but I also knew would be very tough mentally. The fact they had had a disturbed nights sleep and had some wet kit to deal with would only add to that mental challenge. And then for the icing on the cake as it were, all that awaited them at the end of the run was the same desert, the same rain, the same wind and the same dehydrated expedition food, in other words nothing to look forward to. Paradise. Dubai may not have much elevation but I would still argue that for endurance athletes it is one of the best places on earth to train as if you can perform here in the pan flat ultimately boring conditions then you can perform anywhere. “Today you will run 50km straight around the bike track, do not run on the bike track, stay on the sand next to it at all times.” The briefing I gave on Friday morning was simple, sounds straight forward but having run this bike track twice before in 50 degree heat and once in the middle of the night as part of another challenge I knew the ask may be tough for some of the guys, they would just not be expecting the mental challenge. That challenge lies in the fact that it is so flat and so straight that you can always see for 5-10km ahead and if you are not running you are asking yourself why not or just asking yourself why full stop. If you can not picture why it is so hard please call me and lets go do it together. The final guys rolled into camp around 8 hours after the start, not even I had the heart to tell them that their challenge was just beginning. A mix of fast flying sand and rain set in for the afternoon and as it did comments like “what are we doing here” “we can just go home and come back tomorrow and run” “it won’t be like this in MDS” “lets go to the shop” started flying around the camp as I sat there taking it all in and saying little aside from “you are all adults with goals, you decide”. I purposely host these camps in Al Qudra as it is relatively close to where we all live so it’s not actually hard to get home so the temptation of that messes with the mind and of course at this time of year the weather is always a challenge. Both add nicely to the mental mayhem. Interesting isn’t it, the whole weekend I did not hear one comment from anyone about their legs being tired or sore. Ref my above comment about our ability and confidence to physically prepare people for these kinds of races, these guys had done the miles and yes there legs were being tested but their legs were the strongest part of them, it would take more than 100km to cause issues. The challenge is in the sitting around in the sand, the rain, the boredom, the mind numbing of the whole experience, the removal of home comforts, the knowing that tonight is another night under the stars where rain is pretty much certain, oh and did I mention the sand in your dehydrated food, well yeah that comes with the package! So back to my point of this little splurge and the title itself. Everyone made it through the night and punched out another 25km on Saturday morning with again no mention of leg pain, in fact for many Saturday was their strongest run. The game of ultra is not about the running, it’s about everything else. 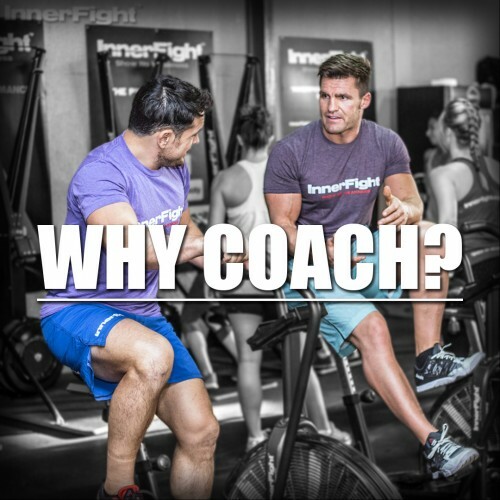 I tell this to every single new client when they come and see me to sign up to be trained for a race and they look at me strange, I again smile knowing that through these camps and their race they are going to learn what I mean. In that learning is where the true benefit of ultra comes into play, the positive impact on many areas of your life, the ability to handle big problems with relative ease and the mental capacity to look at any challenge and say “yes I could do that”. That is what ultra brings…just along the way you run a bit which is also super nice. I love this sport and I love the fact that a dozen people spent 3 days out in the desert this weekend in less than ideal conditions because I know that all those people will be mentally stronger human beings because of it and will now be back in their “normal” lives with skills that make those lives better. 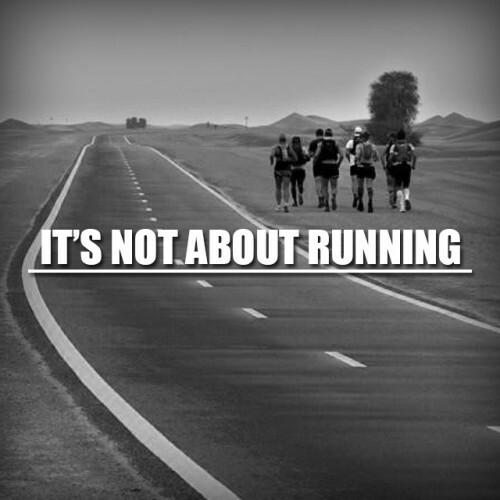 For the seasoned ultra athlete this is nothing new but for those who have just hopped on the bus or are thinking about it just remember…….it’s not about running. Is it time to try CrossFit? Why Coach? The Rewards of being a Coach.